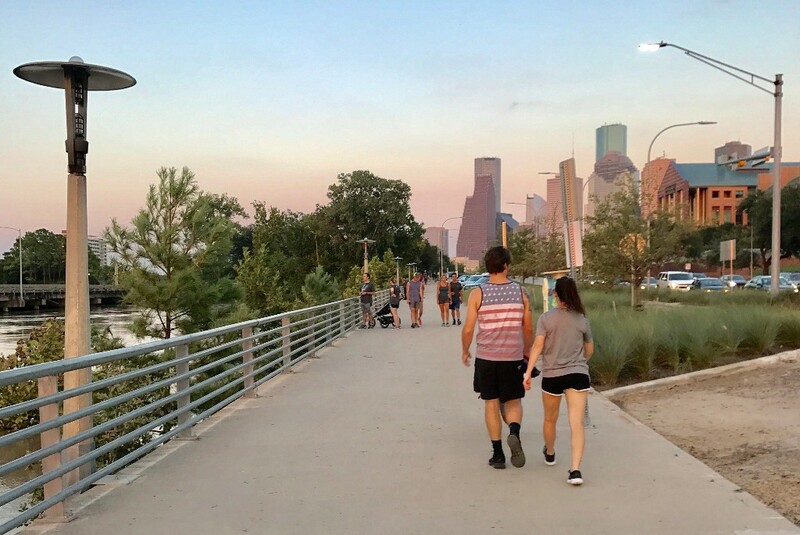 Buffalo Bayou Partnership (BBP) recently launched a major planning effort to bring a new network of waterfront parks and open spaces along Buffalo Bayou’s East Sector, stretching from US 59 to the Port of Houston Turning Basin. As part of the organization’s East Sector outreach, Buffalo Bayou Partnership is collaborating with students from the University of Houston Graphic Design and Creative Writing Programs to present Encounter: Meeting Points on Buffalo Bayou on Saturday, April 7th. This afternoon event features site-specific, text-based installations at six locations along Buffalo Bayou’s East Sector. Using the sites as inspiration and vehicles for content, the students created large scale typographic/text based messages/stories that activate and animate. The installations express interpretations of the history, economy, resilience, culture and community values of the East Sector neighborhoods as they relate to the bayou and green spaces. The public is invited to take self-guided tours of the installations and share ideas and opinions related to Buffalo Bayou Partnership’s future plans along the Bayou’s East Sector. Participatory activities ranging from nature walks to boat tours will be offered at the sites and live entertainment and food trucks will be located at the North York Boat Launch site. This event is made possible in part through the City’s Initiative Grant Program of the Houston Arts Alliance. Encounter: Meeting Points on Buffalo Bayou is funded by the Cynthia Woods Mitchell Center for the Arts in the Kathrine G. McGovern College of the Arts. Visit buffalobayou.org for more information. View more photos here. Buffalo Bayou Partnership’s goal for this planning project is to reclaim the waterfront for East Sector residents and create green spaces that will catalyze the equitable revitalization of their communities. Resiliency – Providing a sustainable waterfront model by limiting environmental or man-made risks while allowing them to adapt in an ever-changing city. Established in 1986, Buffalo Bayou Partnership (BBP) is the non-profit organization transforming and revitalizing Buffalo Bayou, Houston’s most significant natural resource. BBP’s geographic focus is the 10-square mile stretch of Buffalo Bayou from Shepherd Drive to the Port of Houston Turning Basin. Thanks to the generous support of foundations, corporations, individuals and government agencies, BBP has raised and leveraged more than $150 million for the redevelopment and stewardship of the waterfront – spearheading award-winning projects such as Sabine Promenade and Sesquicentennial Park, protecting land for future parks, constructing hike and bike trails, and operating comprehensive clean-up and maintenance programs. 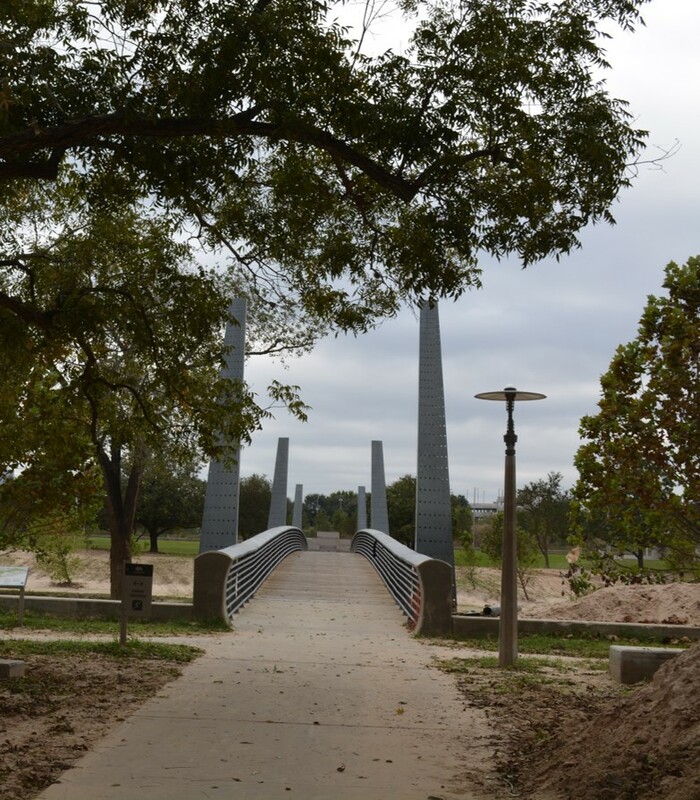 BBP recently completed the $58 million Buffalo Bayou Park project that includes major destinations, natural landscaping, footpaths, trail lighting, water features and pedestrian bridges. Buffalo Bayou Partnership maintains and operates Buffalo Bayou Park, with annual funding provided by the Downtown Tax Increment Reinvestment Zone (TIRZ) #3. Buffalo Bayou Partnership also seeks ways to activate Buffalo Bayou through pedestrian, boating and biking amenities; volunteer activities; permanent and temporary art installations; and wide-ranging tours and events that attract thousands. For more information, please visit www.buffalobayou.org. Welcome to the Buffalo Bayou Blog! One of the things I have always loved about Houston is how persistent our natural world is. I’m from up north, where each spring you race to coax the season from the ground hoping that life will finally return to the world. Here, you spend all your time hacking back everything you have declared unworthy, hoping to make a bit of room for that rose bush you love so much. This blog is going to be about everything that’s crowding out and nibbling on the rose bush and I hope to help Houston learn to celebrate the profusion of life that will rush into any open space we forget to build on. Most particularly, I’m going to write about Buffalo Bayou Park. I have had a 30 year romance with this park, living just a half mile north. I loved it when it was wild and a bit frightening and I have learned to love it almost as much now because I get to share it with so many people. Buffalo Bayou Park is a wild space and in each blog post, I hope to share with you something I saw on a walk in the park. Sometimes it will be a huge and amazing thing; often, it will be something small and amazing. Life is amazing and it is running wild in Buffalo Bayou Park. I am Alisa Kline, a Texas Master Naturalist, and I hope you join me as I attempt to chronicle the wonders of our Park. HOUSTON, TX — Discovery Green, the 12-acre park in the heart of downtown Houston, kicks off its Spring 2018 Season with the Bayou City Music Series. This new concert series honors the great jazz, blues and zydeco musicians of Houston in free concerts taking place in three parks. March 1, with opening performances by the High School for the Performing and Visual Arts (HSPVA) Jazz Ensemble; Milton Hopkins, B. B. King’s bandleader; and Jewel Brown, former vocalist for Louis Armstrong’s Orchestra. This event takes place on the 10th anniversary of Discovery Green’s first-ever event in 2008, “One for Doc,” a concert honoring HSPVA’s nationally recognized jazz program. On Saturday, April 7, Grammy Award-winning pianist and record producer Robert Glasper returns home for his first performance at the historic Emancipation Park. The HSPVA Jazz Sextet, from Glasper’s alma mater, will open. Bayou City Music Series: Bun B, HSPVA Jazz Ensemble, Milton Hopkins, Jewel Brown Thursday, March 1, from 6:30 to 9 p.m.
Bayou City Music Series: Robert Glasper, HSPVA Jazz Sextet Saturday, April 7, from 6:30 to 9 p.m.
Saturday, May 19, from 6:30 to 9 p.m.
HOUSTON – February 12, 2018 –Buffalo Bayou Partnership (BBP) announced eight new members to its board of directors during its annual meeting and luncheon on January 26th at La Griglia. New board members include Shawn W. Cloonan, Chief Operating Officer & Vice President for the Texas Medical Center; Gaynell Floyd Drexler, Attorney-at-Law; Michael D. Fertitta, SVP and General Counsel for Hilcorp Energy Company; Christina Morales, President/CEO of Morales Funeral Home; Winifred Riser, community volunteer; Shannon B. Sasser, Shannon Sasser Architecture; Carson Trapnell Seeligson, InVista Advisors, LLP; and Christof Spieler, PE, LEED AP, Vice President and Director of Planning for Huitt-Zollars. The following board officers are continuing with their roles again this year: Thomas Fish, Chair; Jonathan H. Brinsden, Vice Chair; Bas Solleveld, Vice Chair; Paul A. Cannings, Jr., Treasurer; and Nory Angel, Secretary. C. Ronald Blankenship, Carolyn W. Dorros, Bolivar Fraga, Cristina Garcia Gamboa, Stacey Gillman, Guy Hagstette, Kellie R. Jenks, Samir Khushalani, Lisa Marshall, Ginni Mithoff, Sara-Ashley Moreno, Judy Nyquist, David Ott, Jr., Alison Porter, Karl S. Stern, Judy Tate, Jeff Taylor, Claire Cormier Thielke, Saul Valentin, Anne Whitlock, Renee Wizig-Barrios, Robert P. Wright and Ellyn Wulfe. Chair Emeritus members include Chuck Carlberg, Brady F. Carruth, Collin J. Cox, Mike Garver, Sis Johnson, Susan Keeton and Bob Phillips. Lynn M. Herbert, John Mooz, Charles R. Parker, Carleton Riser and Geraldina Wise. Click to download additional photos. Unlike other parts of Buffalo Bayou, the East Sector was not impacted heavily by Hurricane Harvey due to its higher elevation. Because of this, one of the plan’s areas of focus will be more on long-term resiliency needs such as new housing opportunities. “We want to not only bring new open space, but also to build a model for resilient, mixed-income residential development that can accommodate Houstonians who were displaced by the storm while enhancing the strong vibrant and culturally rich East Sector,” states Olson. The high caliber multidisciplinary planning team working on the East Sector plan is led by Michael Van Valkenburg (MVVA), an internationally recognized landscape architecture firm, and HR&A Advisors, an industry-leading real estate, economic development, and public policy firm. Other consultant team members include: Utile(Urban Planning & Design), Huitt-Zollars (Architecture and Civic Engineering), Stantec (Transportation) and Limnotech (Hydrology). MVVA brings to Houston wide-ranging experience and a proven track record of success in creating acclaimed and economically viable parks and waterfronts such as Brooklyn Bridge Park and Hudson River Park in New York City, and Maggie Daly Park and the 606 in Chicago. The firm is also very familiar with Houston as they recently completed plans for The Menil Collection, Hermann Park and Houston Parks Board. For more than 35 years, HR&A has been working with parks throughout the US and abroad to develop open space real estate strategies, financing plans, programming activation, and sustainable operations and maintenance programs. The High Line and Brooklyn Bridge Park in New York City, Tulsa Riverfront and Dallas Trinity River are among the more than 100 parks that have benefited from HR&A’s talent. The Buffalo Bayou East Sector planning project has been funded by Bank of America Charitable Foundation, The Harry S. and Isabel C. Cameron Foundation, The Carruth Foundation, Inc., The Clayton Fund, Fifth Ward Redevelopment Authority (TIRZ #18), The Garver Foundation, Greater East End Management District, Harrisburg Redevelopment Authority (TIRZ #23), Albert and Ethel Herzstein Charitable Foundation, Houston Endowment Inc., Midway, Anne Whitlock and Michael Skelly, The Winston Charitable Foundation and The Wortham Foundation, Inc. Volunteers removing dead trees along Buffalo Bayou last weekend. Happy New Year!! As we begin 2018, we are writing to provide you with an update on our post-Harvey cleanup work and continuing Buffalo Bayou restoration. We are pleased to report that sediment removal in Buffalo Bayou Park is nearing completion. To date, we have collected and hauled off nearly 30,000 cubic yards. We would like to take this opportunity to thank the Millis Construction and Sprint Sand and Clay crews for their steadfast work over the past five months. They have done a yeoman’s job for us. 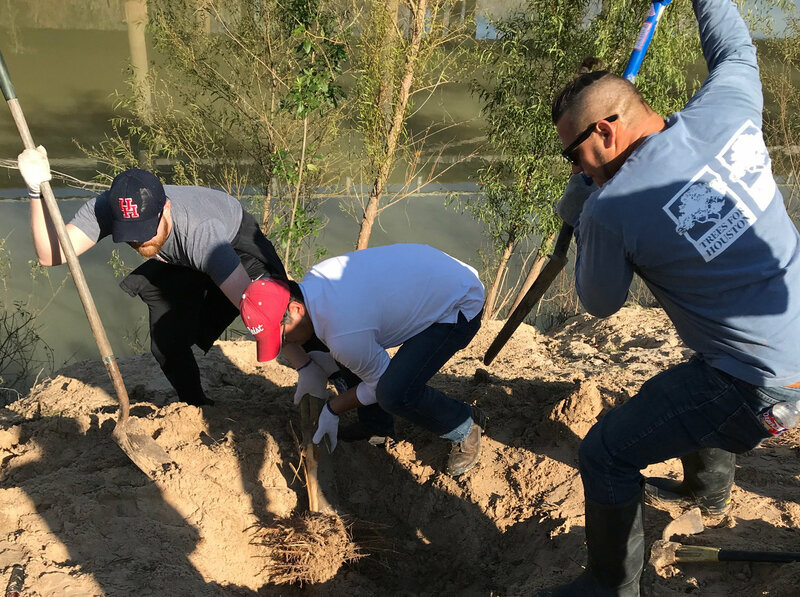 Within the next month, we will be removing the sediment at Allen’s Landing as we prepare for post-race festivities for this year’s March 10th Buffalo Bayou Partnership Regatta (a new ending location). Before and after sediment removal at Carruth Bridge. Hurricane Harvey caused BBP to take a serious look at the sustainability of the Johnny Steele Dog Park, and we have determined it is time to make some adjustments. We are working with SWA, Buffalo Bayou Park’s designers, to develop plans for reducing the frequency that the area goes under water. Foremost among these changes will be the removal of the large dog pond. Decisions about the small dog pond area are still underway. By making modifications, we hope to create a space that dogs and their owners will continue to enjoy, and a site that our park staff can more easily maintain. Our goal is to have many of these improvements completed and the dog park open by late spring, although we expect some work may require more time. Our Buffalo Bayou Park maintenance team has begun repairs to trail erosion areas, and this work will continue through the spring. There are several trail segments where BBP will need to hire an outside contractor. In addition, Harris County Flood Control District will be designing plans for major repairs near the Rosemont Bridge, Wortham Fountain and Beth Yeshurun Cemetery. In cooperation with the Houston Parks & Recreation Department, BBP is assessing the erosion damage along the trails in downtown. Please know that the north side trail between Sesquicentennial Park and the University of Houston-Downtown is closed due to severe erosion at a pedestrian bridge location. Hundreds of trees were impacted as a result of the storm. While we know now that many are dead it may be several years before we know if larger trees survive. During these colder months, you will see us planting new trees in several park areas. We would like to thank the team at Trees for Houston for its support in our tree planting efforts. 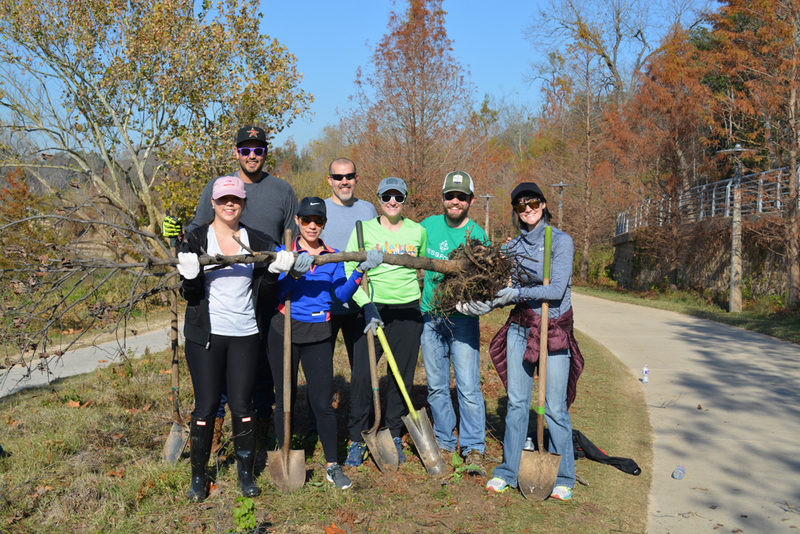 Next month, the Redbuds and Bayou Buddies, Trees For Houston’s and BBP’s respective young professional groups, will hold their annual Planting on the Parkway event north of the Police Memorial in Buffalo Bayou Park. More than 150 native trees will be planted. As we highlighted in previous communications, hydrologists on our East Sector master plan consultant team have been hard at work looking at erosion along the bayou’s East Sector. We hope to have this work completed in time for a series of public meetings in the East End and Fifth Ward that we will be holding in February. We’d also like to point out that we are working with the Texas Department of Transportation and CenterPoint to break ground on trail segments east of downtown. You will be hearing more about our East Sector planning and trail work in the near future. We have had more than 1,000 Houstonians volunteer their time at our post-Harvey cleanup events. We are extremely grateful for the many school groups, corporations andfamilies who have taken the time to help us shovel sediment, remove debris and trim trees. Thank you! Thank you! Thank you! We will continue needing volunteers as we plant trees and restore Buffalo Bayou Park’s wildflower and prairie areas this spring. To volunteer, please contact Leticia Sierras at volunteer@buffalobayou.org. In closing, we would like to express our gratitude to all of the generous individuals, corporations and foundations that have made gifts to our Buffalo Bayou restoration efforts. We have had an outpouring of support from new donors as well as longtime BBP friends and for that, we are truly grateful. A very special thanks goes to the Kinder Foundation and Elkins Foundation for their major gifts. We also sincerely thank the many guests at our November gala that made additional commitments to assist with Buffalo Bayou Park’s recovery. Please know our financial needs continue. If you would like to contribute, please contact Leigh McBurnett at lmcburnett@buffalobayou.org or visit buffalobayou.org. In closing, I would like to sincerely thank the entire BBP staff. Our maintenance crew has worked tirelessly over many months. Needless to say, the conditions have been very challenging. My thanks also goes out to our administrative team who have worked with volunteers, the media and funders. They too have contributed greatly. And thank you to all of you who have lent a hand and encouraging words. It has meant a great deal to us!! Thank you. FREE AND OPEN TO THE PUBLIC. Explore exhibitions by architectural designer Jae Boggess and students of the UH School of Art. Both of these exhibits feature buildings and landmarks located east of downtown Houston along Buffalo Bayou, which is relevant to Buffalo Bayou Partnership’s newly launched East Sector master plan. This major planning effort along Buffalo Bayou going east will incorporate East Sector neighborhoods and existing structures to establish a pioneering precedent where green space can be a catalyst for inclusive growth and community development. For more about the Buffalo Bayou East Sector Master Plan here. Funded by a grant from The Rice Design Alliance, this photography exhibit documents industrial and commercial buildings east of downtown. In danger of demolition, these neglected and largely vacant buildings help tell the story of Houston as a repeated boomtown and have the potential to define a unique sense of place as these neighborhoods change. Architectural designer Jae Boggess hopes that the exhibit will prompt a dialogue about what will become of our city’s built history. Encounter: Meeting Points on Buffalo Bayou is a collaboration between students from the University of Houston Graphic Design and Creative Writing programs with funding support from the Cynthia Woods Mitchell Center for the Arts. The exhibit features proposals for site-based installations and engagement events to be held on sites along Buffalo Bayou’s East Sector in spring 2018. 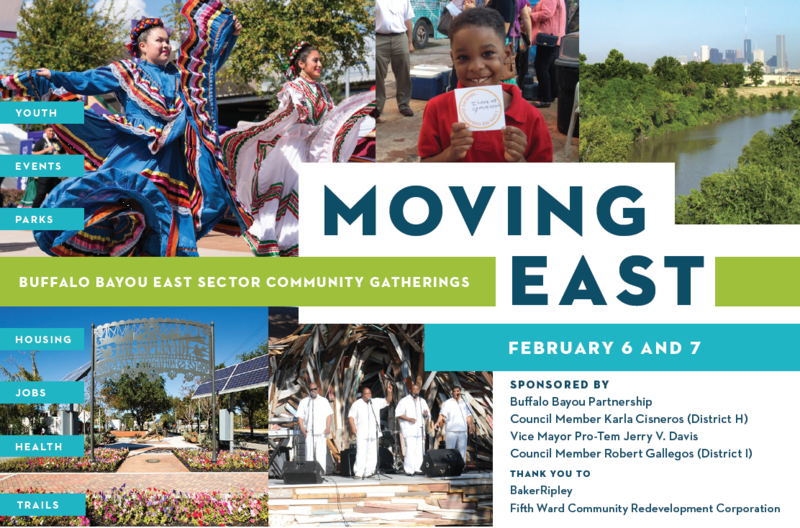 The installations express an interpretation of the history, economy, resilience, culture and community values of the East End and Fifth Ward communities as they relate to the bayou and green spaces. The Urban Land Institute is a nonprofit education and research institute supported by its members. Its mission is to provide leadership in the responsible use of land and in creating and sustaining thriving communities worldwide. Established in 1936, the institute has more than 40,000 members worldwide representing all aspects of land use and development disciplines. For more information, visit uli.org or follow us on Twitter, Facebook, LinkedIn, and Instagram. Since Hurricane Harvey, Buffalo Bayou Partnership has been focused on cleanup efforts along Buffalo Bayou. We hope this update will provide you with valuable information, show you the challenges that we have been facing, and give you a glimpse of how hard our maintenance staff is working. These trails are open from Shepherd Drive to Sabine Street. However, we do have equipment working in nearby areas so please use these trails with caution. The U.S. Army Corps of Engineers ended the releases from the Addicks and Barker Reservoirs a week ago. Due to the high water levels we experienced for nearly six weeks, numerous footpaths in Buffalo Bayou Park have suffered erosion. We are currently in discussions with Harris County Flood Control District representatives about needed repairs. Other areas along the downtown stretch of Buffalo Bayou also experienced trail erosion. The majority of our maintenance crew’s time has been spent removing silt and stockpiling it for hauling. We have gone through a very thorough process to test the silt, following the policy guidance of the Harris County Flood Control District (HCFCD). We were pleased to learn after testing that the silt can be handled without special measures, and so, beginning Monday, October 23 Sprint Sand and Clay, with the assistance of Millis Construction, the Buffalo Bayou Park construction contractor, will be hauling off the silt for disposal. We expect the hauling to take several weeks. Please note there also are numerous flood benches in Buffalo Bayou Park that were specifically designed for sediment collection. Sediment removal in these areas is the responsibility of the Harris County Flood Control District. Hundreds of trees all along Buffalo Bayou were impacted by Hurricane Harvey. We are clearing downed trees, removing trash (particularly plastic bags), and standing up those that are leaning and can be saved. In some cases, we will not know until spring if the trees will survive. Barbara Fish Daniel Nature Play Area: Due to needed stair repairs, this site is currently closed. We expect it to be open within the next three weeks. Johnny Steele Dog Park: This site is closed and will remain closed for several months. Please know we are currently discussing adjustments to this area to prevent the on-going damage and the extensive maintenance hours it takes to maintain this site. Bike and Canoe/Kayak Rentals: As reported earlier, Bike Barn is fully operational at the Wortham Insurance Visitor Center while Bayou City Adventures has curtailed all boat rentals for the remainder of the year from the Lost Lake Visitor Center. The Dunlavy: Please stop by The Dunlavy when you are out and about in the park. The popular café was up and running several days after Hurricane Harvey. 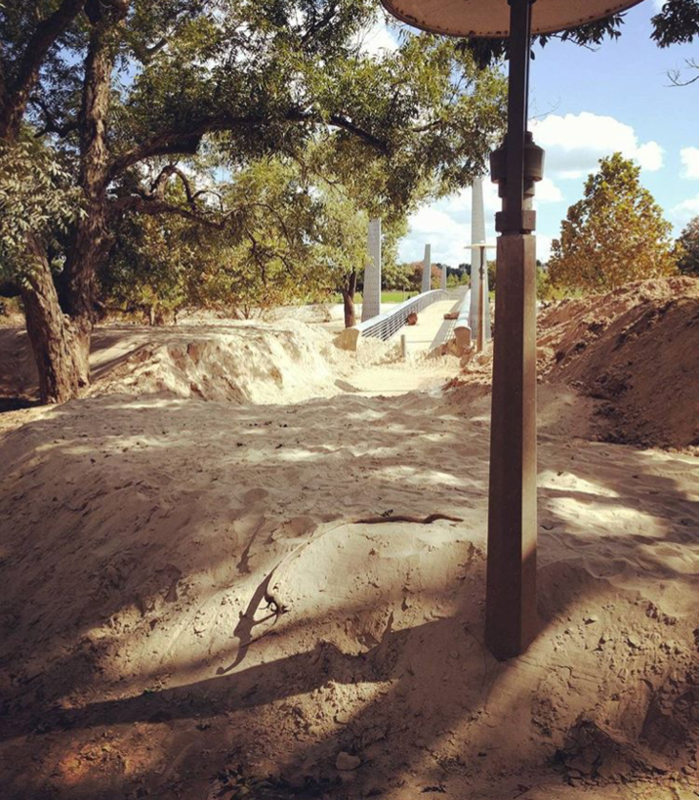 Buffalo Bayou Park Cistern: We are happy to note that the history tours through this historic water reservoir are taking place Thursday-Sunday. Visit our website at buffalobayou.org to purchase your tickets. The bats at Waugh Drive Bridge are steadily recovering from Harvey’s flood, staying “Houston Strong.” The bat colony was hit hard and the population is definitely lower, but bats are roosting in many of the bridge’s crevices again. While the weather remains warm (above 50° F), the bats are emerging at or after sunset to hunt for insects across the night sky as usual. Bats roosting at other nearby parking garages and buildings are joining the Waugh Bridge emergence farther down the bayou. East of downtown, Buffalo Bayou took quite a hit. Several high banks significantly eroded and as a result, trails have been undermined or failed completely. As part of our East Sector master planning project that kicked off in early fall, our hydrology consultants are working with Dr. Phil Bedient, a Rice University civil and environmental engineering professor and director of the Severe Storm Protection, Education and Evacuation from Disaster Center (SSPEED), to develop an understanding of historical channel evolution and past storm events, develop a suite of combined rain/surge/rise conditions, and gathering, evaluating, refining and applying models. This information will be very valuable when we begin our community engagement process at the beginning of 2018. It also will inform design decisions relating to trail and park construction, and housing development along the bayou. We have been truly gratified by the number of volunteers who have contributed thousands of hours to the Buffalo Bayou cleanup. We could not be making as much as progress as we are were it not for the many individuals, corporate volunteers and school groups that are helping us. If you would like to volunteer, please go to our website www.buffalobayou.org. We also are thankful for the many people who have supported us financially. In addition to generous Houstonians, we have had individuals from throughout the country send us very thoughtful donations and encouraging words, including the staff at Madison Square Park Conservancy in New York City. When this group saw images of Buffalo Bayou in the media they sent requests to their members asking for donations to assist Buffalo Bayou Partnership with our cleanup. 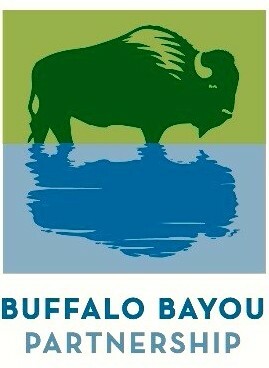 In closing, please know we are working as swiftly as possible to bring back the beauty of Buffalo Bayou. We ask for your continuing patience and support. For those interested in donating to Buffalo Bayou Partnership’s Harvey clean-up efforts, please click here. Thank you.